STAS offers various types of art gallery hanging systems. Our systems allow you to display art professionally, flexibly and securely. 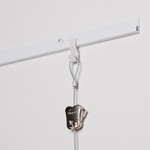 It consists of picture rail with complementary picture hooks, picture hanging cables or hanging rods. 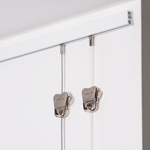 The gallery systems cover the broadest range of applications. From small photo displays to professional museum systems capable of carrying weights up to 220 lbs per hanger. 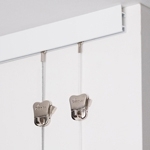 Using a gallery hanging system – what are the advantages? A gallery picture hanging system ‘s main advantage is that it allows you to change picture frames, paintings and works or art very quickly, as often as you like, without using any tools and without damaging the walls. Which gallery hanging system / art display system is best suited for you? STAS j-rail max – for professional applications, additional anti-theft system is available. STAS cliprail max – features a top rim that connects with your ceiling. 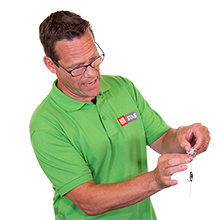 With this system, your ceiling, wall and hanging system smoothly unite. STAS multirail crown – wall mounted system with integrated 12V lighting system which can be almost completely hidden using an ornamental frame or a STAS moulding. 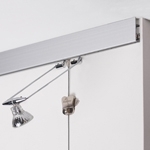 STAS multirail max – wall mounted system with integrated lighting that can be installed tight to the ceiling. Designed for perfectionists. STAS multirail flat – ceiling mounted system with integrated 12V lighting system, can be perfectly plastered into a single or double flat decorative framework. With the aid of several accessories our j-rail max gallery system can be augmented with a theft delaying system. 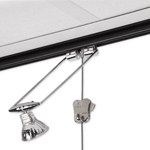 These accessories include the STAS j-rail max security hook, security suspension rod and security cap. 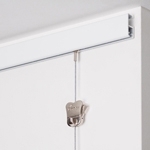 The security hook can be closed with a screw, to prevent someone removing the picture from the hook. 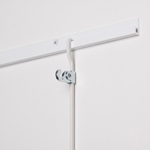 The suspension rod can be fixed to the rail with the security cap to protect it from theft. STAS: secure and professional picture hanging!